Light Up Lawn Mount Address Plaque - - personalized LED-powered plug-in sign illuminates your address for better visibility, provides landscape lighting, and enhances curb appeal. Made in USA. A lighted address marker enables emergency responders, visitors, and delivery drivers to easily spot your house in the dark. Also available for wall mount (see top link in Related Products). Personalized with the lens color, font, power option, and house number & street name you supply. Six lens colors (click second small image): black, burgundy, chocolate, burnt orange, blue, and green. Five font options (click first small image): twcent, century 751, poor richard (shown in large image), brushed script, and vonique. Three power options: plug in 120vac to 5vdc; solar panel 5vdc; and a landscape lighting transformer and adapter that converts 12vac (from normal landscape lighting systems) to 5vdc and connects to the landscape lighting line just like regular landscape lights do. Each sign is custom printed with your address, not merely standard stick on letters. House number line holds up to five (5) 3-7/8" numbers. Street name line holds up to twenty (20) 1-1/2" characters. Characters have a 3D appearance and look almost engraved. Dimensions (total): 15.5"W x 14"H x 2"D; weighs 2.35 pounds. Dimensions (sign area only): 12"W x 7.25"H.
Acrylic lens, ABS plastic top, ABS composite backing, and stainless steel screws. Plug-in installation requires an electric source but not a switch. (Sign is always on, but illumination effect is visible only at night.) Approximate yearly operating cost is $5.00. Installation needs holes for two below-ground stakes (included). Choose a site within 10' of an electric outlet or landscape main wire. If outlet is more than 10' away, you will need to splice in a wire. Route wire and plug in transformer to outlet or connect to landscape lighting system. Drive stakes 12.5" apart leaving at least 4" above grade. Includes two 12.5" below-ground stakes (see small image with instructions) made from waterproof deck composite. 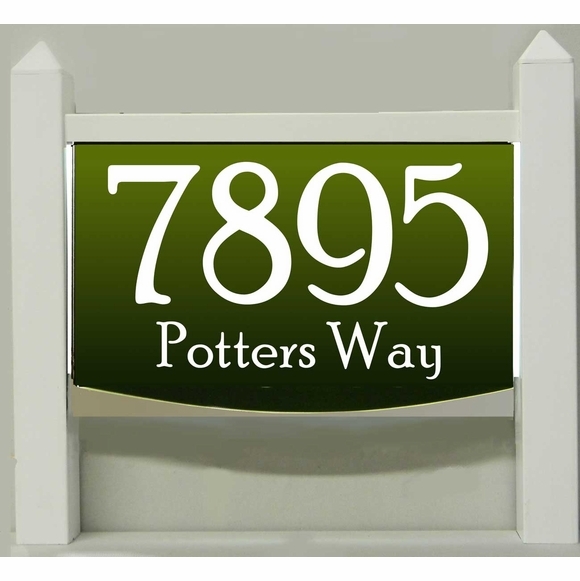 Address shown in large image: 7895 Potters Way.